Police Arrest Third Suspect In New Haven Synthetic Marijuana Overdose Case Over three days, more than 100 people fell ill after smoking a batch of K2 officials say was laced with AB-Fubinaca. Police Chief Anthony Campbell said chemical was "knocking people down." 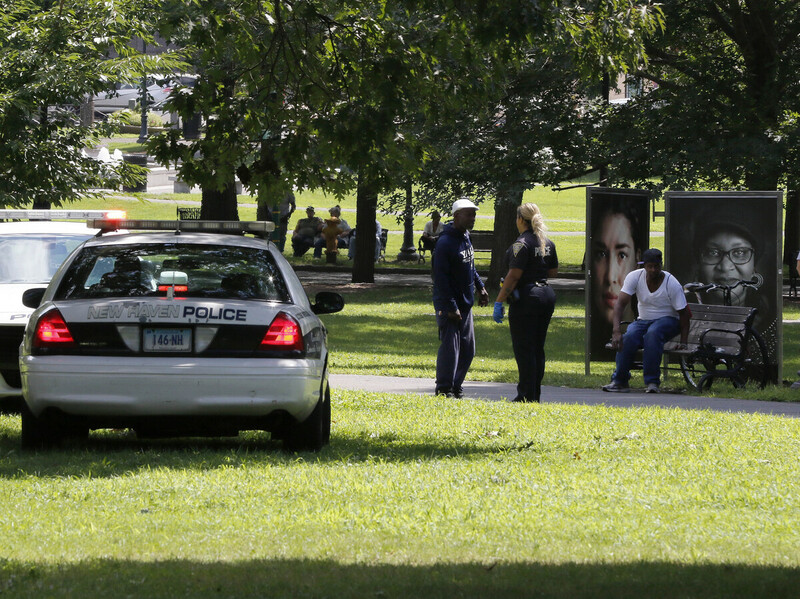 A police officer speaks to a man walking on New Haven Green, Wednesday, Aug. 15, in New Haven, Conn. More than a 100 people fell ill from suspected drug overdoses linked to a batch of synthetic marijuana laced with fubinaca. A third man has been arrested in connection with a toxic batch of synthetic marijuana, called K2, that led to more than 100 overdoses between Tuesday and Thursday night in New Haven, Conn., according to officials. New Haven Police Chief Anthony Campbell made the announcement at a news conference on Friday morning, describing the latest suspect as a man with "a history" with the department. The suspect has not been publicly identified. Campbell also released the results of tests indicating that the K2 causing the rash of overdoses had been laced with a substance called fubinaca. "We've been trying to get the word out to make sure people understand please not to use this K2, it is clearly contaminated," he pleaded from the steps of City Hall. "One of the chemicals is fubinaca, which is really supposed to be, for whatever reason, knocking people down and taking them out." The Drug Enforcement Agency says AB-Fubinaca is found in numerous synthetic cannabinoid products smoked for their psychoactive effects. The patent was filed by Pfizer in 2009 but it has no approved commercial or medical uses. Authorities initially suggested the synthetic marijuana contained the powerful opioid fentanyl. "The overdoses started late Tuesday night and Wednesday morning in the historic New Haven Green, the city park that lies in the shadow of Yale University. It was just a few at first. By Wednesday morning, police were dealing with as many as nine overdose cases in one hour." Officers arrested John Parker, 53, and Felix Melendez, 37, on Wednesday afternoon after they had each been identified by overdose victims who claimed the men had been distributing the drug at the park, The Associated Press reported. The majority of this week's medical emergencies occurred at the green, Campbell said on Friday. The Hartford Courant reported court records show there was a warrant for Parker's arrest for allegedly selling K2 at the green in February. "Parker had been seen pedaling rapidly away on his bicycle when people started dropping from the drug and medics and police came in waves. Investigators believed he rode back to his room at one of the motels in the Pond Lily Avenue area of the city. Police supervisors and officers went from place to place asking desk clerks, until they located Parker's room. Officers went in through a partially opened door, and there was Parker, sitting on the bed. He was handcuffed and taken into custody on the outstanding warrant from February. He gave police permission to search, the court records state. They found 32 packets of substances that tested positive for K2, and packaging materials." There was also a warrant out for Melendez, a convicted drug felon, who had previously been arrested for dealing, the Courant reported. "And there was Melendez, standing in the living room, eating a hamburger, according court records. Police officers found a packet of K2 in Melendez's pocket, small amounts elsewhere in the apartment, and a batch of empty plastic bags that are commonly used to package K2, according to the court records." The AP reported Melendez and Parker were charged with drug crimes. However, police are still trying to establish their connection to the overdoses. The man arrested on Friday was apprehended by federal authorities, according to the AP. Dr. Sandy Bogucki, emergency medicine specialist for Yale-New Haven Hospital, told the Courant the batch of K2 was rapid, but short acting version of the drug. "People who smoked it or ingested it tended to go down very fast, almost right in their tracks," she said. Campbell told reporters one of the downsides of short-term effects of the drug is that many of the people treated at the hospital returned the the park for another high. Some were brought back to the hospital "up to four to five times," he said.